Place-making can be a great tool for improving community engagement and rewriting the narrative of an underutilized or deteriorated area. It not only physically improves public spaces for people, it can also provide economic benefits by enticing further public and private investment, and it serves as a way of bringing diverse populations and cultures together to work towards a common goal. Place-making can be anything from pop-up seating, to street art, or in our case, community chalkboards. We will be using the chalkboards at several events this summer, including LIVE on the Waterfront in an effort to gain a greater understanding of how the Binghamton community views the rivers, along with what projects or initiatives they would like to see done in the future. Check out our first place-making activity! Community responses will be used to inspire future projects. Come share your thoughts at our next event! What makes a place Successful? 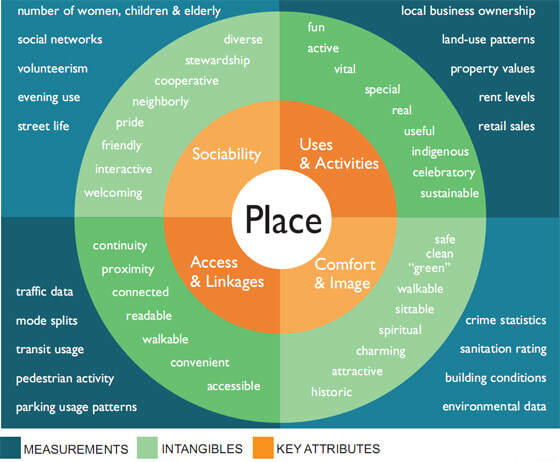 After analyzing thousands of public places, The Project for Public Spaces (PPS) created a diagram for identifying successful public places. The common themes are accessibility, comfort, engaging, and sociable.